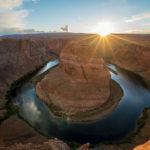 This post is in partnership with Expedia.com. As always, the guide truthfully reflects my own travel experiences and opinions from my time in New Orleans. Deciding to visit New Orleans doesn’t need any convincing. At 300 years old, New Orleans knows just how to entertain its visitors with colorful stories from the past, live music, art, culture, and of course, food and drink! This guide will help take any stress out of planning your 3 days in New Orleans itinerary. 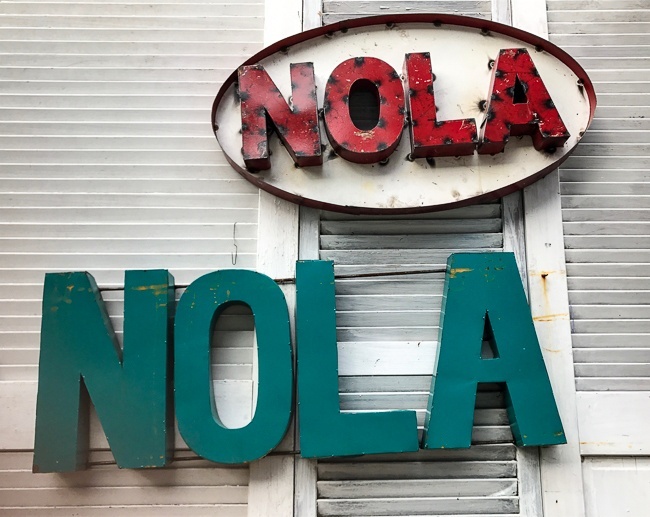 You’ll find all the details on what to see and do, must-have experiences, can’t-miss foods, and tips to make your NOLA trip a success! Most visitors choose to stay in the French Quarter and the downtown Central Business District area. The neighborhoods are convenient for what to see in New Orleans in 3 days. They also have access to streetcars and are among the safest parts of the city. You can find a wide variety of places to stay at Expedia.com New Orleans Hotels to make all travel budgets happy. Another choice is to stay in the Garden District close to St. Charles Avenue. The streetcar makes it quick and easy to get to the French Quarter, not to mention how much quieter it is! Laissez les bon temps rouler! Translated from the Cajun French, it means, “Let the good times roll!” And, with three days in New Orleans, you won’t have to look too far or too hard to land yourself smack in the middle of some good times. The French Quarter is iconic for its architecture, jazz, food, Bourbon Street and of course, its annual raucous Mardi Gras celebrations. So, it makes perfect sense most NOLA visitors start their trip here. Jackson Square sits in the heart of the French Quarter, just steps away from both Bourbon Street and the Mississippi River. The square is a National Historic Landmark and a natural gathering spot. The palm tree-lined square, named after Andrew Jackson, has a statue of him riding a horse in honor of his victory in the Battle of New Orleans against the British. Several of the streets around the square are pedestrian-only zones which makes it easy for musicians to pick up their instruments for a spur of the moment performance and for anyone within earshot to wander over and enjoy the show. 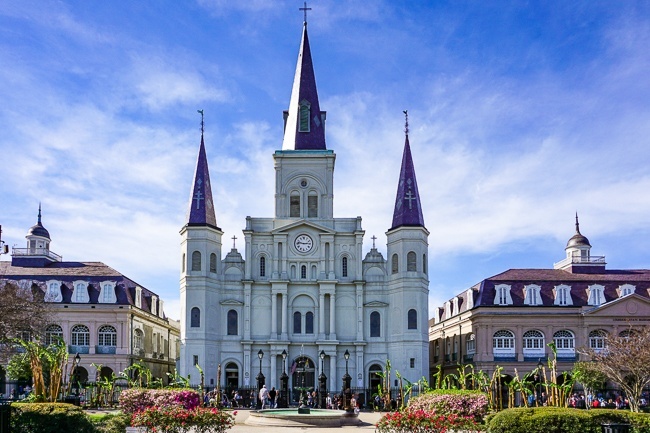 St. Louis Cathedral is undoubtedly Jackson Square’s crown jewel with its white facade and striking triple spires. It’s the oldest cathedral in the United States, dating back to 1850 after previous churches from the early 1700s were burned down, rebuilt, and later expanded upon to what you see today. Visitors can walk around inside every day from 8:30 am – 4:00 pm, except during Mass times. From Jackson Square and St. Louis Cathedral, walk towards the Mississippi River and cross Decatur Street for an elevated perch to capture the Instagram-worthy view overlooking the square! At this point, you’ll have surely smelled the powdered sugar sweetness floating through the air around the Square and Cathedral. 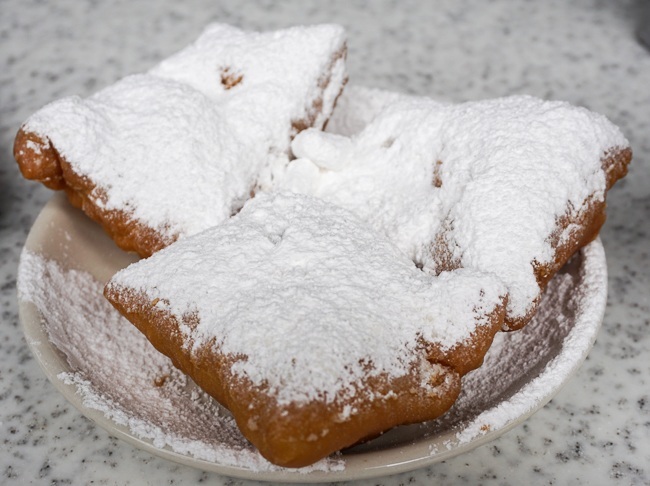 Cafe du Monde and their famous beignets are just a few steps away, on the same side as the river. Whether you’ve got a 3 day trip to New Orleans planned or are just making a quick visit, you don’t want to miss out on the sweet doughy goodness of this signature New Orleans treat! 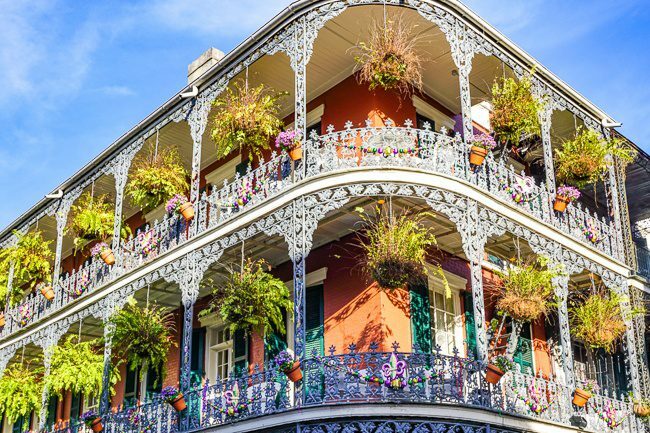 With a sugar rush, the time couldn’t be better for one of New Orleans walking tours, starting with the French Quarter’s history and architecture. Or perhaps you’re interested in a New Orleans food tour through the French Quarter, instead. There’s even a fascinating New Orleans voodoo tour like I did to learn more about myths, superstitions, and famous figures like Marie Laveau. If you decide to stroll the French Quarter on your own, don’t be afraid to put down the map and meander. It’s such a compact area, there’s no concern about getting lost. Starting at Cafe du Monde, you’ll find the French Market which runs for 6 blocks through the French Quarter. 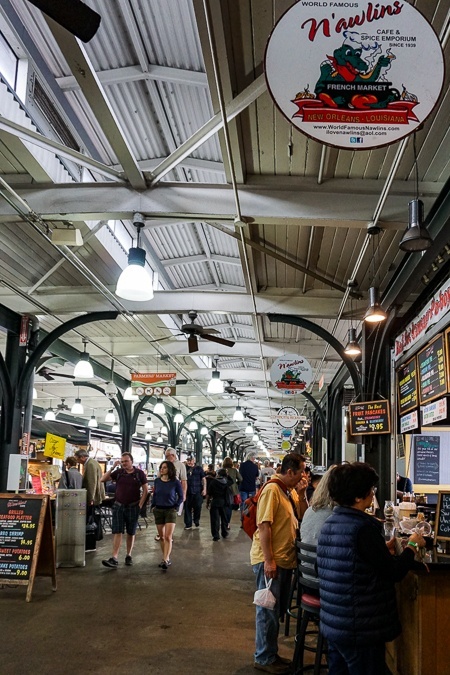 It’s part flea market with trinkets and artist goods and part food promenade with everything from produce, pralines, and New Orleans spice shops so you can make your own gumbo back home. Of course, you’ll also want to see the neon of Bourbon Street. But an even better walk is taking Pirates Alley just along the left side of the Cathedral (if you’re facing it) to get to Royal Street. For several hours every day, a stretch of blocks along Royal Street become a pedestrian walkway. 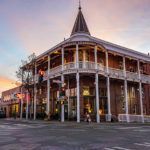 Visitors can pop into boutique shops, voodoo stores, art galleries, iconic restaurants like Brennan’s, be entertained by street performers, admire the architecture and wrought iron balconies, and even visit inside the historic Gallier House. You might also notice Cafe Beignet on Royal Street which some say has better beignets than Cafe du Monde. You’ll have to compare and decide for yourself. As for me, it was a toss-up. How could I decide when they were both so good!? You also won’t want to miss the Shrimp Po-Boy at Johnny’s Po-Boys on St. Louis Street! It’s just a quick walk from Royal Street and Jackson Square and worth every bite. Any itinerary listing what to do in New Orleans for 3 days has to include nightlife! Sure, in NOLA, it can feel like the party never ends, but this is certainly not the city to retire early for the night. Bourbon Street is unquestionably known for its bars, mammoth-sized cocktails, and party atmosphere. But, unless you’re looking to let loose with some spring break-style drinking, you’ll want to avoid the Bourbon Street scene at night. 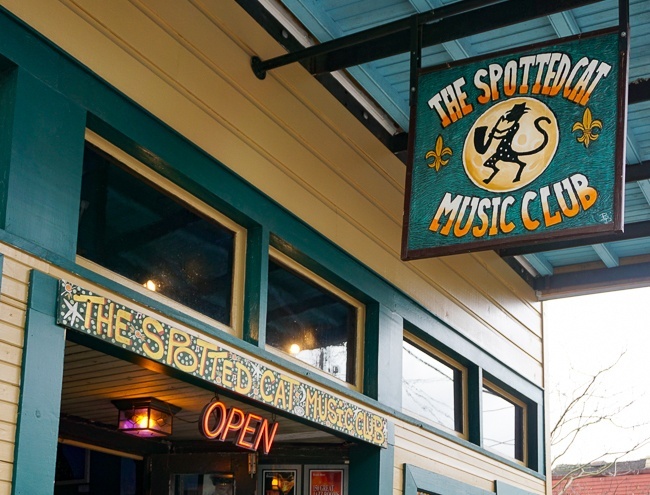 Instead, head to the live music clubs on Frenchmen Street. It’s actually close enough to Bourbon Street to walk. And, while Frenchmen Street goes for several blocks, between Decatur and Chartres Streets there’s enough music, food, and drink to have you booking your next trip to New Orleans! I couldn’t help but be drawn in by the singing voice coming from the Spotted Cat and before I knew it, a couple of hours had passed! You might be wondering why I haven’t mentioned the iconic French Quarter jazz venue, Preservation Hall. It’s absolutely possible to see a show here (40ish minutes) and then head to Frenchmen Street. 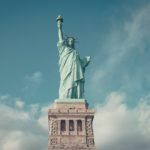 Depending on the night of the week, prepare to wait in line for up to an hour and remember with no food, drink (BYOB), or AC and the likelihood of standing during the performance, this venue isn’t right for everyone. And if you’d rather skip the traditional nightlife activities altogether, New Orleans has plenty of night tours, including popular New Orleans haunted tours, where you’ll search for the spirits said to roam through the city streets and cemeteries. A New Orleans itinerary in 3 days must include time exploring the beautiful Garden District! Start with the New Orleans Streetcar that runs along the St. Charles line. If you’re staying in or near the French Quarter, there are convenient stops just a short walk away. Use this New Orleans streetcar map as a guide. 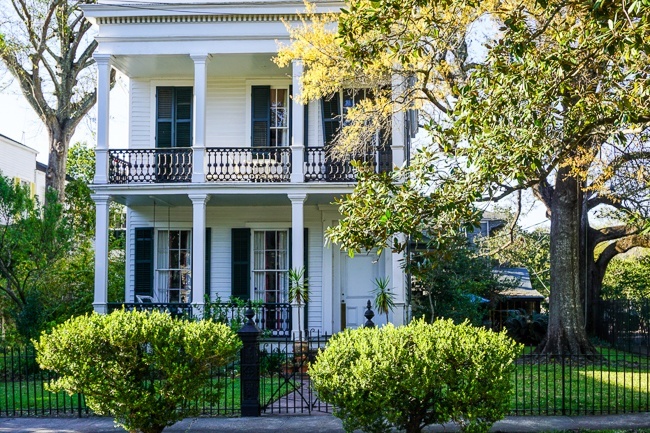 Ride the streetcar along St. Charles Avenue to see the classic mansions that make the Garden District so famous. Go the entire route (30-40 minutes) to the end of the line and simply get back on for the return. If you’re on a budget, there’s no cheaper way to do some New Orleans sightseeing than with the $3 all day streetcar pass. Now, with a sense of the Garden District (and beyond), you’ll be able to hop on and hop off as you’d like to see more of the area. 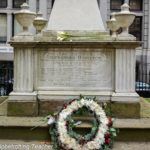 On the return, buzz for a stop at St. Charles and Washington to visit Lafayette Cemetery 1. New Orleans cemetery tours, DIY or self-guided, are popular with visitors because of the ornate above-ground tombs and the uniquely New Orleans history and culture of the cemeteries. If you’re looking for a place to have an upscale NOLA lunch, the famous Commander’s Palace is just across from Lafayette Cemetery 1 on Washington Avenue. It’s been named one of the best places to eat in the south! 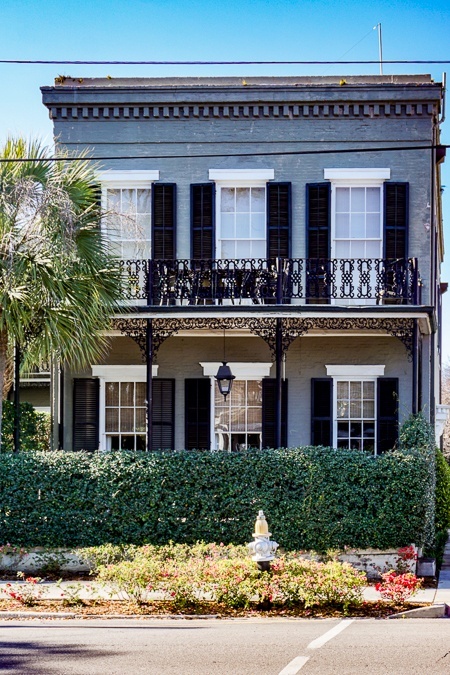 Afterward, spend time strolling to admire the gorgeous Garden District homes! On Prytania Street between Washington Avenue and First Street and looping back along Coliseum Street are numerous historic (sometimes celebrity-owned) mansions. The homes in this neighborhood typically have wrought iron galleries on both levels and some with a gorgeous wrap around porch. Many of the homes are also colorful, reflecting the historic period they’re from. When I visited in spring, the mature trees were leafy and lush and bright flowers were in bloom everywhere. It was so pretty that I couldn’t help but think of some of the beautiful historic homes and gardens I’d also seen in Washington, D.C. 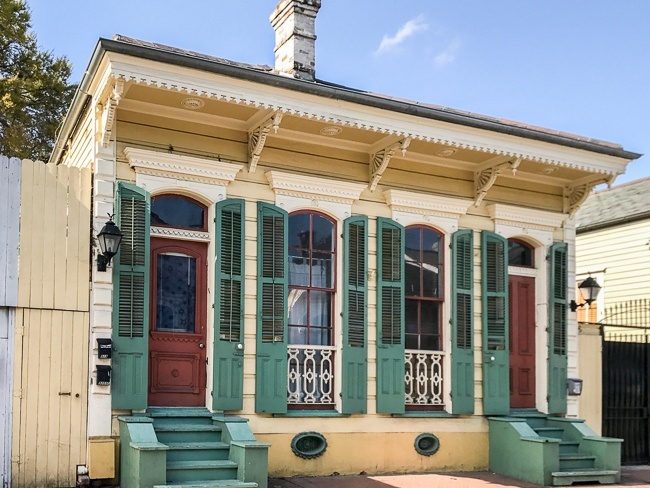 If you’d rather, a New Orleans Garden District tour is a great way to learn more about the architecture and history of specific homes. Afterward, head to Magazine Street, just 3 blocks from Lafayette Cemetery 1, with St. Charles Avenue at your back. At 6 miles long and stretching through a range of NOLA neighborhoods, it’s probably best to stick with the section within the Garden District, unless you plan to use the bus or grab an Uber. Magazine Street is lined with homes, shops, and places to grab a meal, a drink or both. 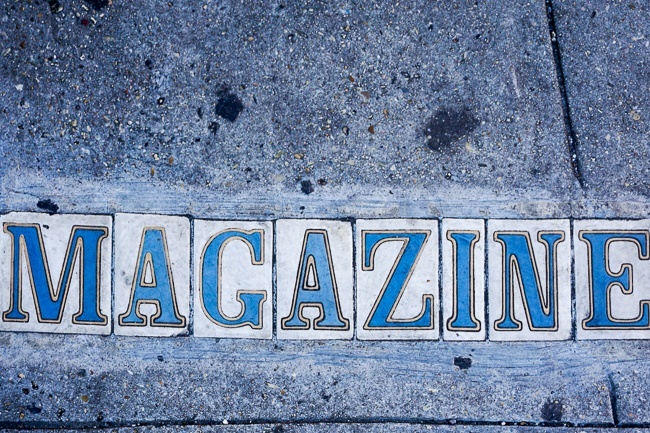 From antiques and vintage shops to artisan fashions and housewares, you’re sure to find the perfect New Orleans souvenir or gift to take home. And with delicious food options like the Mexican food at Juan’s Flying Burritos and the sweets at Sucre, Magazine Street has plenty of places to relax and refuel. Alternatively, take the St. Charles streetcar back towards the French Quarter, getting off at Lee Circle in the Central Business District to visit NOLA’s top-rated WWII Museum on the other end of Magazine Street. 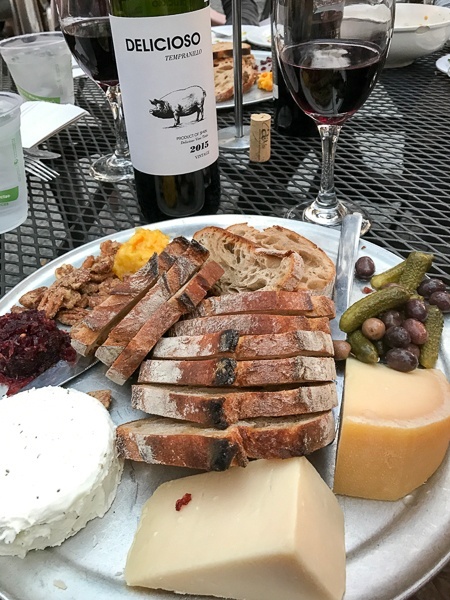 After spending time in the French Quarter, Frenchmen Street, and the Garden District, why not go off-the-grid for some drinks, food, and live jazz? Total disclaimer! Of all the things to do in New Orleans at night, this was my favorite! Bacchanal Fine Wine & Spirits is in a hidden corner of New Orleans. As my Uber driver got on the highway from the Garden District, I felt the need to recheck the address with him just to make sure we were on the same page! What looks like a hole-in-the-wall wine shop in a remote industrial corner of the city revealed itself to be a light-strung patio, where customers could uncork the wine they bought and have it served up with a cheese plate and other delicious goodies from the kitchen all while enjoying live music. You’ll feel as if you’re in a local’s backyard but with the off-chance Norah Jones just might show up for an impromptu set. Day trips always make even the quickest getaway feel longer. Luckily, a New Orleans three day itinerary can also include time exploring just outside the city. 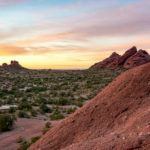 However, if you’d rather stay put, there’s certainly plenty more to see, do, and eat(!) in the city proper. 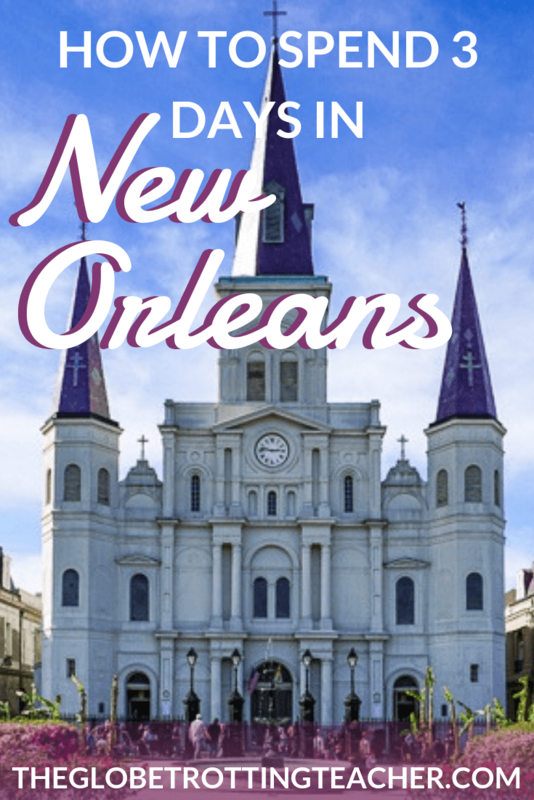 You could take a New Orleans river cruise on the Steamboat Natchez, grab a drink at Lafitte’s Blacksmith Shop, visit Louis Armstrong Park, or take a class at the New Orleans school of cooking, to name a few. 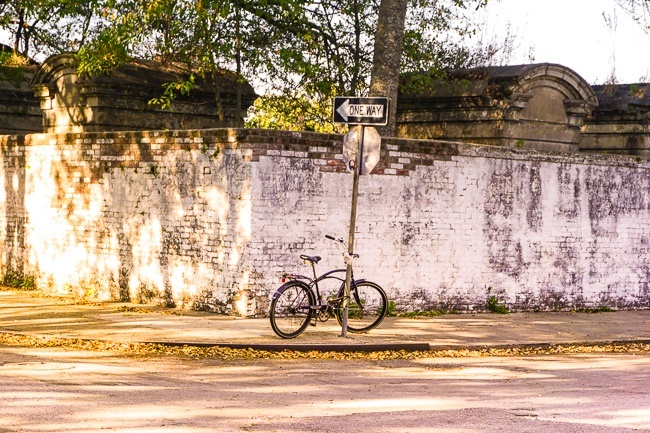 Better yet, for the best of both worlds, choose a half day tour option from among the most popular New Orleans day trips and spend the other half of your last day back in New Orleans. Plantation life is uniquely southern and what better place to learn more about them than in Louisiana. 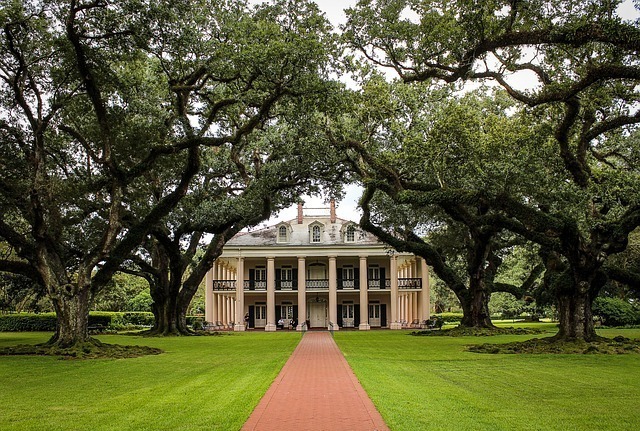 Oak Alley Plantation and Laura Plantation are the most commonly visited. 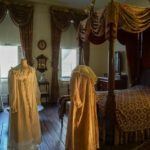 They’re included in nearly all of the best plantation tours from New Orleans, which teach about plantation life and the history of New Orleans and Lousiana before the Civil War. Whitney Plantation, on the other hand, focuses on slavery and what life was like for the slaves living on the plantation. There are personal narratives and exhibits of the slaves who lived on the plantation which can certainly be more emotional but important history to understand nevertheless. Depending on how long you’d like to spend, look for full day tours and half day tours with the plantations you’d like to see. Most have pick-up spots in the French Quarter. Either way, if you’ve visited historic homes elsewhere, like in historic New Castle, it’s interesting to see the difference in architecture and style between north and south. 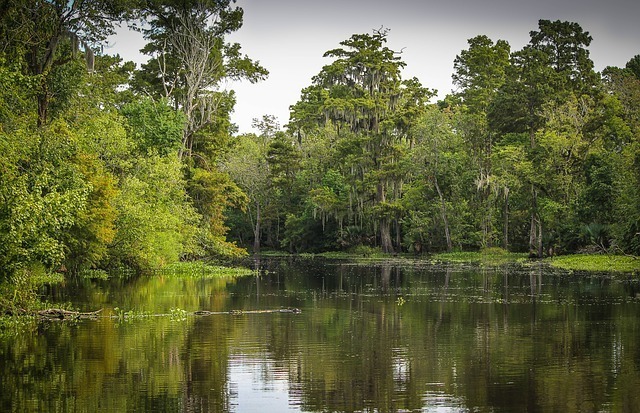 Less than an hour outside of New Orleans, you’ll find swamps and bayous alive with alligators, birds, and lush greenery from the Spanish moss on the trees to the marshy grasses reaching up and out of the water. The best swamp tours in New Orleans typically bring visitors to either the Honey Island Swamp or the Jean Lafitte National Historic Park and Preserve. Depending on your preference, you can tour the bayous near New Orleans on a swamp boat, an airboat, or even in a canoe. Personally, I’m an airboat fan. I love the thrill but also find these boats to be smaller and therefore have fewer people. If you’d also like to do a plantation tour, some companies offer a combination of the 2 activities for a full day outing. 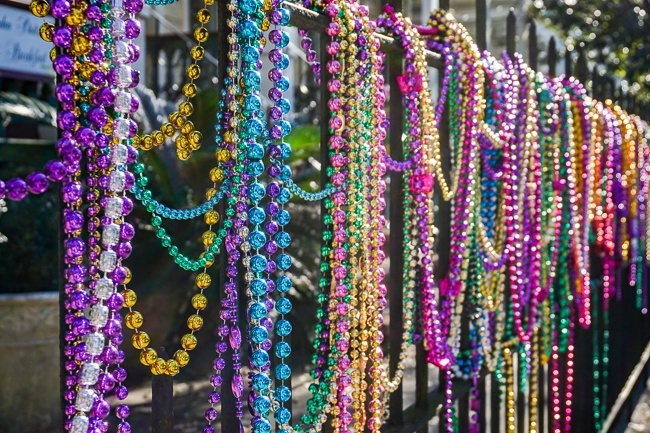 First and foremost, unless you’re planning to take part in the Mardi Gras festivities, avoid coming to New Orleans during the annual celebration. Prices are high and the party can get rowdy. 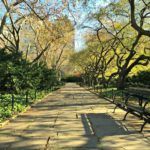 Overall, however, spring and fall are great times to visit because the weather is pleasant and the parks and gardens are in full bloom. I visited in early spring, shortly after Mardi Gras. The city seemed to still be recovering from its Mardi Gras hangover but many decorations were still up. Summer is super hot and humid, which can make walking around uncomfortable. 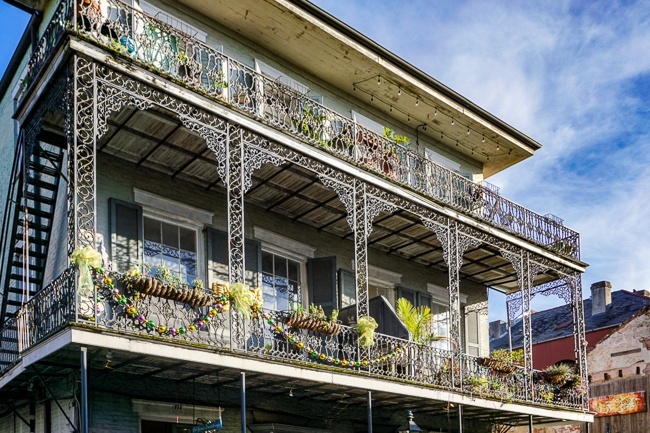 Luckily, New Orleans is not too far from many areas of the U.S, making it easy for a weekend getaway outside of the typical summer vacation season. Unless you’re visiting New Orleans as part of a larger road trip, there’s no need to have or rent a car. Taxis and Ubers are widely available, and coming from NYC, the Uber rides were downright affordable! Streetcars and public buses are cheap and easy to use. You can easily get from one end of New Orleans to the other with just the St. Charles line! If paying with cash on a streetcar, you must have exact change. As someone who never has spare change, I found it super easy to download the GoMobile app. I purchased my pass through the app and then scanned the barcode on my phone each time I boarded a streetcar. The French Quarter and the Garden District are also very pedestrian-friendly. With just a pair of my favorite comfortable Superga walking shoes, I was able to see many of New Orleans top sights on foot. With 300 years of history, culture, food, and music, New Orleans has so much to see and experience. 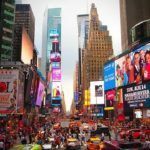 You don’t want to miss out on everything this iconic American city has to offer! 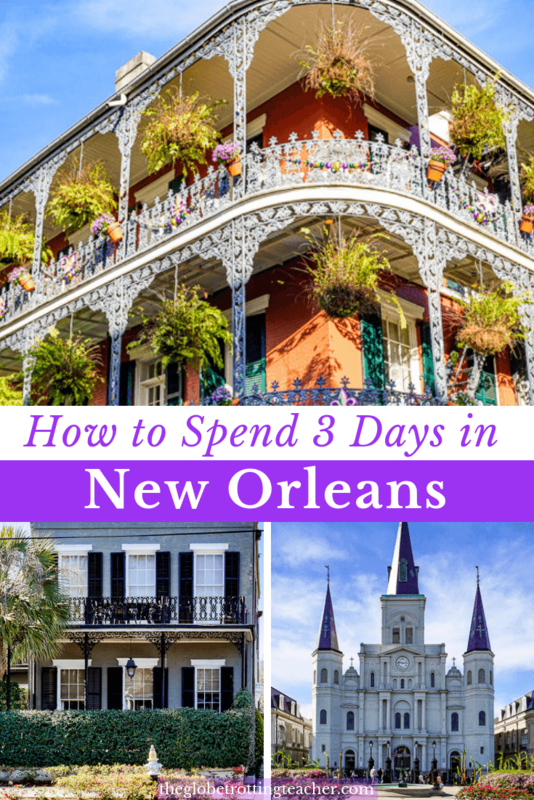 So, what do your 3 perfect days in New Orleans look like?